We’re excited you’re joining us! 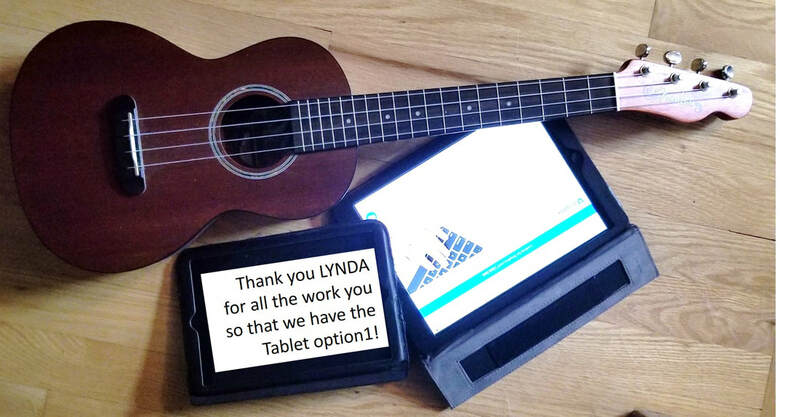 Using @Songbook on a tablet has many benefits. It’s more portable than the big songbook and the storage is endless. You can make the print as large as you want. There’s a built-in metronome set at the pace we do it in the jam, so you can practice at the SOUP pace. We’re able to put in tips and stuff that there’s no room for on a paper version. We can make corrections constantly with no bother for you (if you’re set up to sync). You’re always up-to-date! You can create and store your own songs! You have to keep your tablet charged enough to use it at a jam! You have to buy the @Songbook app (around $13) for your tablet. You may also want to purchase something to attach it to a music stand (but you can also put it on a table or your lap). 1. When you see the word “@Songbook”, it refers to the @Songbook Chordpro app that we use on the tablet or computer to store the songbook songs. 2. When you see the word “SongBook” (2 caps) it refers to the folder name within Dropbox and @Songbook that contains SOUP’s songs. Get the “Dropbox “app on your tablet (free). Get the “@Songbook Chordpro” (by Linksoft) app for your tablet (video tutorial on the website) When you do this step, @Songbook forces Dropbox to create a file called SongBook. That’s the file we will use to store SOUP SONGS. Access the SOUP SONGS files by clicking on the dropbox link on the website. Dropbox will ask you where you want to put the files. You want them in the folder called “SongBook” in Dropbox. Don’t look in the @Songbook app until you successfully have the SOUP SONGS file inside a folder named “SongBook” (capital S, capital B) in Dropbox (not anything else, like “Songbook 1”. This is VERY important. The songs won’t show up in the app until you have this completed. You may need to rename folders, delete empty folders… get a geek to help in you need it. When you have SOUP SONGS inside a folder called “SongBook”, proceed. It doesn’t matter if you make a mess of it; delete the SOUP SONGS and start over again. Now go to the @Songbook Chordpro app (yellow icon). Find “settings”, and scroll down to where you see “Link Dropbox” and follow the steps as prompted to help @Songbook link with Dropbox. Make sure it’s also switched on to “sync automatically”. Go back to the main “song” page, and all the songs will load. If they don’t, it’s certain that you have not successfully done one of two things: either a) you don’t have the songs in a folder called “SongBook”, or b) you have not linked and synced properly through settings. F#dim may be a two finger-chord rather than 4 on some songs. Easier. Whoo Hoo! The physical set-up of the song might be different; fewer words on a line. Easier to read! Whoo Hoo! Diagrams for ALL chords are on the page. Whoo Hoo! You never have to move your eyes around a page. Just scroll the song by touching the arrow at the bottom left of the screen. You can hit the arrow at the start of the count-in. Once in a playlist, songs may be in the wrong order. Touch the icon with the three yellow bars at the top right corner of the playlist, and then touch “sort songs”, then “by title”. Let us know if you need help!!! Make sure you designate the “instrument” at the top of the settings page once in songbook. Ukulele C is what you want. You can also switch on “show chords on side” to see the chords. If your comments are showing up too dark, or you want to change something else about how it looks, do this in “settings”… “comments”. The “colour” is the colour of the words, and “background” is the shaded background that you can make any colour you like. Use your screen vertically, rather than horizontally, although a few songs need a horizontal orientation (This Little Light of Mine, and California Dreamin’). Small tablets won’t work as well. Try to adjust the size of the words so that they’re not too big or too small. The more words you see on a page, the better the scrolling will work. Start with the intro in the center of the page, and touch the arrow (bottom left for most tablets) to scroll the song. Look for Lynda at a jam if you have problems.